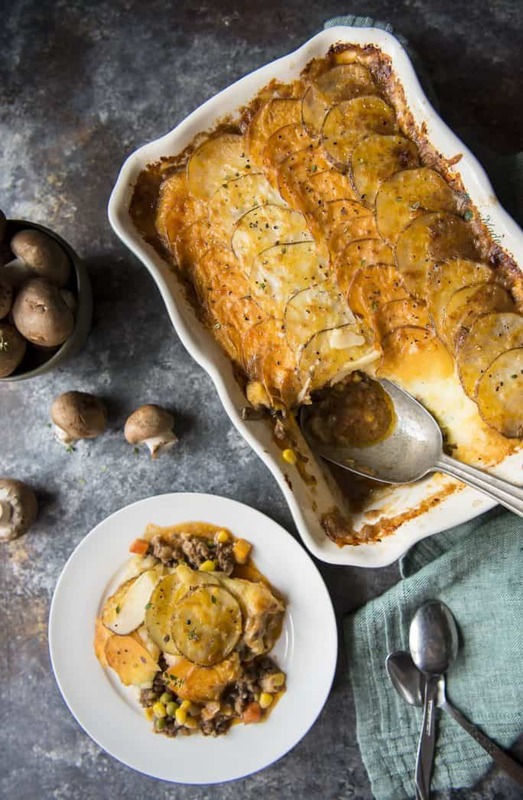 Irish comfort food at it’s finest, this Scalloped Potato Beef and Mushroom Shepherd’s Pie puts a heartier spin on the classic. 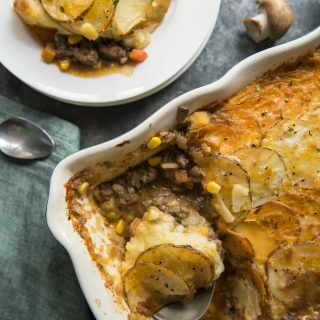 Ground beef, onions, and diced veggies are mixed with chopped mushrooms, then topped with mashed potato, then another layer of scalloped potatoes. I know. It’s Monday, and we’re all still trying to get it together from the time change yesterday. But it’s also IRISH WEEK and that calls for all kinds of joy and near-immediate hunger for corned beef. Or maybe a quick and easy shepherd’s pie is more your thing? In that case, I’ve got a fun little twist on it that you are going to LOVE. Where are my mushroom lovers at? This is right up your alley. I’m going to come right out and say it before anyone can correct me: This is technically a cottage pie. Except, extra-technically, shepherd’s pie wasn’t even called shepherd’s pie until the 1850s. Regardless of the meat inside, this recipe was cottage pie until someone decided the lamb version needed a special title. It’s all in the meat. The ingredients are pretty much the same, but a shepherds pie contains lamb, while cottage pie contains beef. And yes, this is beef. And mushrooms, of course. You might remember back in January, I told you about Abe and I taking the Blenditarian Pledge this year. We may not be able to stick to a workout plan, but we’re much better about sticking to easy commitments like this. It’s so simple, and you might even turn a mushroom hater in your family into a mushroom lover! 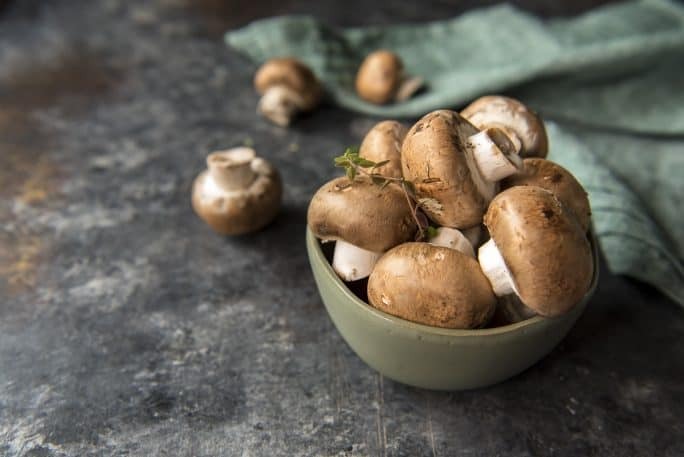 Blending adds an extra serving of healthy vegetables to the meal and when cooked properly, mushrooms can easily mimic meat. Just chop to match the consistency of the meat they’re paired with and no one will be the wiser. In the case of this shepherds pie recipe, it’s ground beef. The most delicious grass-fed beef I’ve ever had, actually. And it’s only enhanced by the mushrooms! How do you make shepherd’s pie? 1. Mash some potatoes. Keep them warm. 2. Chop up your favorite mushrooms to match the consistency of the ground beef. 3. 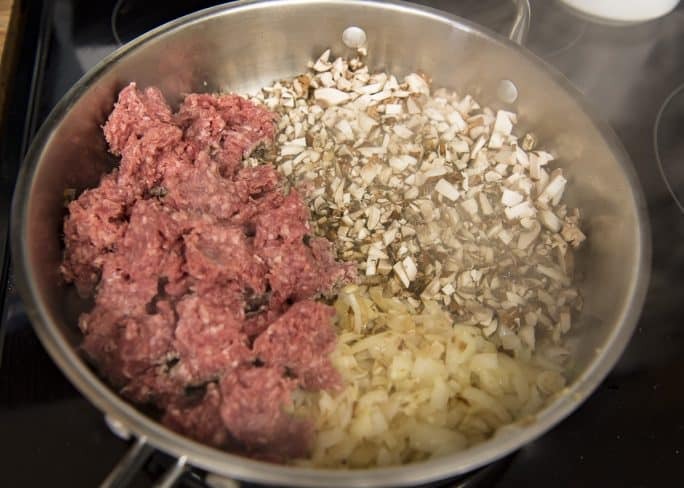 Blend the chopped mushrooms with the ground meat and some sauteed onions. Cook it up with your delicious gravy ingredients. 4. Add some mixed vegetables, then toss it all into a casserole dish. Top with mashed potatoes. 5. Bake to perfection. Toss on some cheese for good measure. 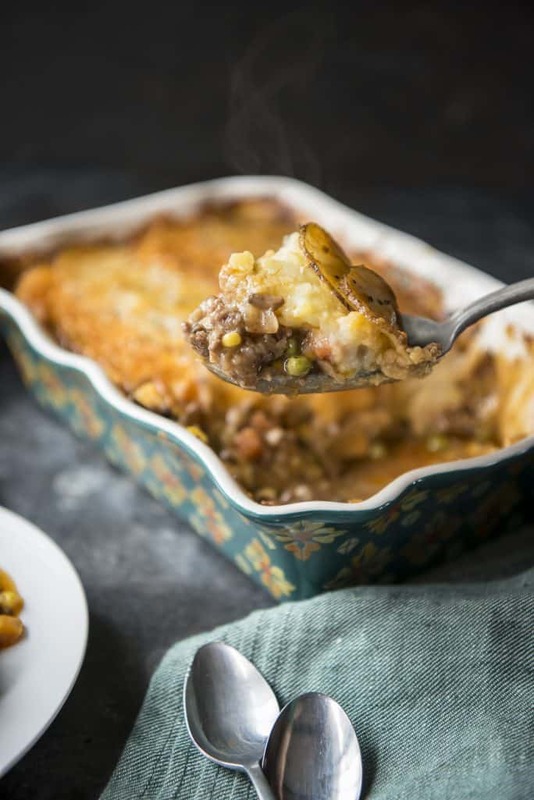 I’ve done something else a little different – a little crazy – with this shepherd’s pie. Mashed potatoes are so traditional, but I wanted a tiny bit of extra texture in this recipe. I thinly sliced some potatoes the way I do when I make a big scalloped potato bake for the holidays and layered them on top. Russet AND sweet. Because I had them both on hand and…why not? 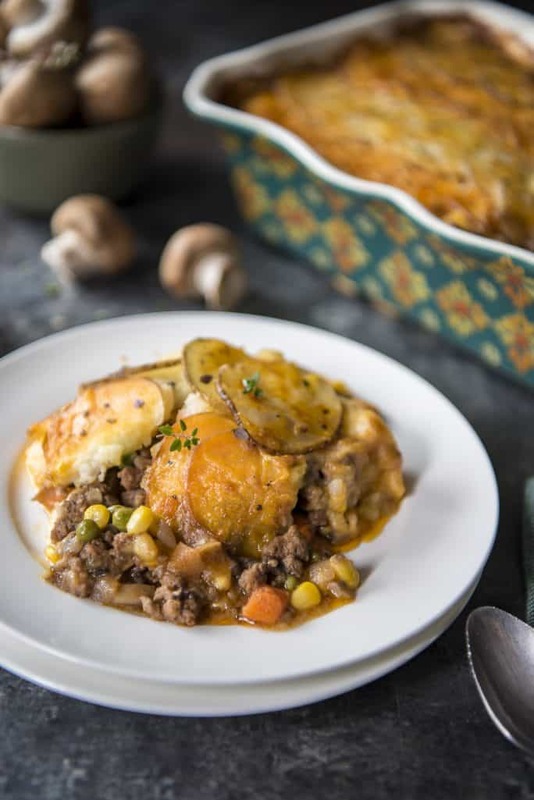 Looking for a full Irish meal to go with this easy shepherd’s pie? Try these tasty additions! 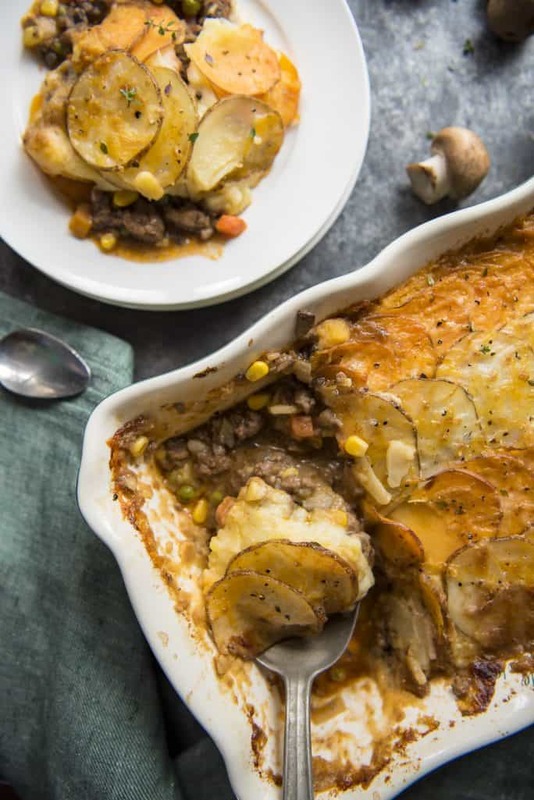 Irish comfort food at it's finest, this Scalloped Potato Beef and Mushroom Shepherd's Pie puts a heartier spin on the classic. 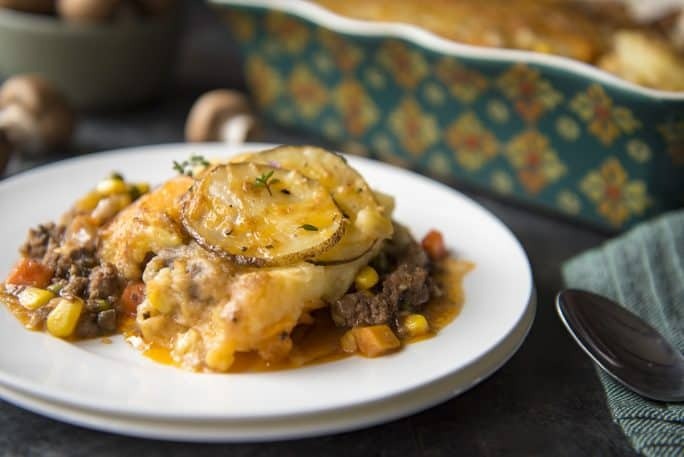 Ground beef, onions, and diced veggies are mixed with chopped mushrooms, then topped with mashed potato, then another layer of scalloped potatoes. Peel the russet potatoes and cut 1 in half and set it aside with the sweet potato. Roughly chop the remaining potatoes into a 1/2-inch dice. Place in a saucepan and cover with cold water and a few shakes of salt, then set over high heat and bring to a boil for 10 to 15 minutes. When the potatoes are fork-tender, drain them through a colander set inside a bowl, then return to the saucepan. Mash the potatoes with a few splashes of the potato water, then add the butter, milk, 1 teaspoon salt, and 1/2 teaspoon black pepper; continue to mash until smooth. Season with more salt and pepper to taste. While the potatoes are cooking, prepare the filling. Heat the oil in large saute pan set over medium-high heat. Add the onion and saute until they begin to soften, 3-4 minutes. Add the garlic and stir to combine. Add the beef and chopped mushrooms and cook until browned and cooked through, 3-5 minutes. Sprinkle on the flour and stir to coat. Cook for 1 minute. Splash in the wine and deglaze the pan. Add the broth, tomato paste, Worcestershire, and herbs, and stir to combine. Season with remaining salt and pepper. Bring mixture to a boil, then reduce the heat to low, cover and simmer 10-12 minutes until the sauce has thickened slightly. Remove the pan from the heat and add the mixed vegetables, stirring to combine. Spread the mixture evenly into a 2-quart casserole dish. Top with the mashed potatoes, starting around the edges to create a seal to prevent bubbling. Use a mandoline to cut the half russet potato and sweet potato into thin slices. Place each potato variety in a microwave-safe container with 1/4 cup of water; cover. Microwave for 4 minutes, then carefully drain the slices through a colander. Rinse with cold water, then place the slices in a bowl of cold water. Shingle the potato slices on top of the mash, overlapping the slices in alternating layers. Brush with the melted butter, then sprinkle on a bit of black pepper. Place on the middle rack of the oven and bake for 25 minutes or just until the potatoes begin to brown. Sprinkle the cheese on top (if using) and broil for 3-4 minutes until browned. Remove from the oven and cool for at least 15 minutes before serving. Garnish with fresh thyme. 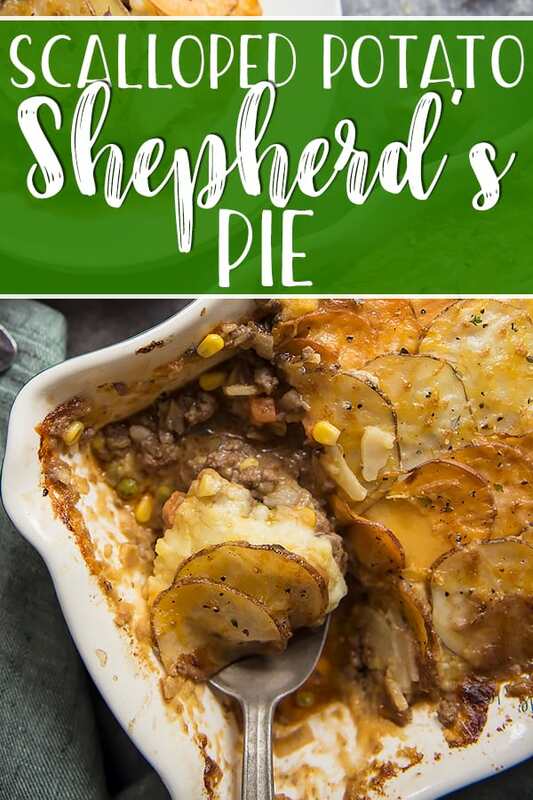 PIN THIS SHEPARDS PIE RECIPE FOR LATER!